We are committed to the ultimate in handcrafted quality here at Carpet Bags, right across our product range. If you’re in the market for one, two or more luxury handbags that will last for many years and be pleasurable and easy to hold and use, as well as making the right visual impression, you really can’t do better than one of our shoulder bags, framed bags, tote bags or similar items. What does it mean to buy a handbag from us? As our company name suggests, our luxury handbags are carpet bags. However, they aren’t just any carpet bags, being made from copies of old Persian silk rug designs and designed for the practical needs and visual sensibilities of the 21st century. Our cotton and viscose carpet bags are crafted individually in Suffolk, and are durable and light while also having a wonderfully silky sheen. We have always prized the highest standards of workmanship here at Carpet Bags, but our luxury handbags are interestingly varied, too. The original and best of our carpets bags will always be our Cosmic Bag, which our founder Loretta first designed and made by hand in 1974. This fantastically versatile bag remains in production today, the Large version’s double leather rawhide straps running through brass sail eyelets, making it usable in all manner of configurations, as the strap can be pulled through for long and short use. Our luxury handbags also come in a vast range of aesthetically pleasing swatches, from the likes of Blue Chiraz, Blackberry and Mosaic to Verda, Pale Mosaic and Distressed. 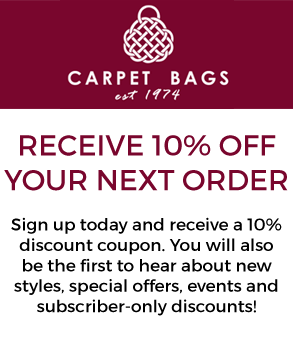 Above all else, though, purchasing a luxurious handbag from us means becoming a part of the legend of the carpet bag. This form of luggage has been favoured by such fabled fictional characters as Mary Poppins and Phileas Fogg, and when you buy from the broad selection of luxury handbags here at Carpet Bags, you can expect nothing less than the very best in British handmade quality. Whether you fall in love with our Bobbie Classic handbag that represents the perfect cross body bag for everyday use, something like the Isabella with its timeless Gladstone shape and leather detail, or – of course – the ever-popular Cosmic bag, you’ll realise just how luxurious and cosmetically appealing a luxury handbag can be when you buy from Carpet Bags.